Tomorrow’s the company Christmas party…. the internal one. Everyone in this small company is being asked to being a dish to pass, and it ends up being an all-day nibble festival. It’ll be a fine day. Time was, years ago, that are used to bring three parts full of chili to such events. Normally, back in the day, these three pots were marked ‘mild’, ‘hot’ , and ‘Holy $#!+’. After the third year of having some jokester shuffling the signs, and seeing Sally Secratary turning green as she screamed…” THAT’S MILD???!!?!? !”, I finally gave up the practice. These days, I simply turn out a mild to medium hot chili that’s usually fairly good. It’s getting to be an expensive proposition to do this though. Maybe seven bucks worth the burger, some tomatoes, some onions, some “baby bella” mushrooms, a little onion, and the rest according to taste. Ah, well, it’s worth it. I work with a good crew. I wanted to pass along a couple of pictures that were passed along to me by readers last year. I never got the chance to use them last season because I didn’t see them until well after new year’s. But now seems as good a time as any to post them. in case you don’t recognize it, I will tell you up front that these are pictures from Arlington national cemetery. They do this, every year. Every headstone in the place, gets a wreath. 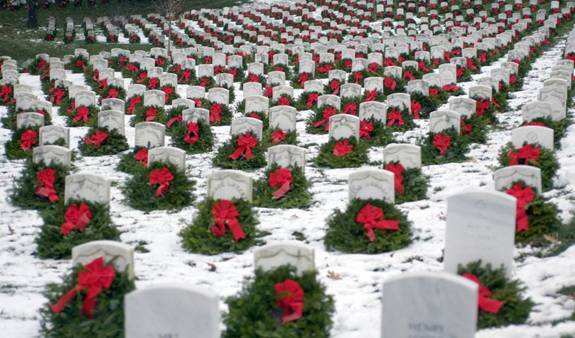 Every person buried at Arlington, is remembered with honor, and perhaps there is no time they are honored more than during the holiday season. The Arlington Wreath project was started on the order of fifteen years ago by the president of the Worcester wreath company in Maine, who apparently decided to send holiday wreaths to Arlington is a way to honor the country’s fallen soldiers . each and every year without fail since then 5000 or so evergreen wreaths are made up in the state of Maine, and then decorated , men loaded on a truck bound for Arlington. 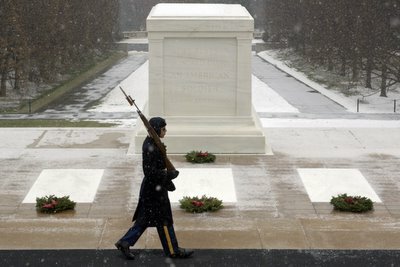 The last I heard, there was supposed to be a wreath laying ceremony this morning at Arlington. Longtime readers of this blog will recall that my wife is something of a fan of one Trace Adkins. Truth to tell, I like him as well… and particularly admire him for recording this one, which this story reminds me of. I know… copyright laws, and all… I hope Trace doesn’t mind, because I think this says it so well, what I feel looking at these pics. And it gave me a chill when he clicked his heels, and saluted me. We made it to Arlington.. I love making chili, and eating it too. I am not one for hot pepper hot; I prefer mustard- and radish-type hot. But I do like the slow burn of a well made medium spice chili. Feeling the sweat dripping of the forehead, watching my family’s faces turn deeper red by the minute, or watching my father-in-law’s bald spot do the same thing is just as good as watching someone’s tongue catching fire. I like Oregon Blackberry Chesecake ice cream. However I do put mustard on my OBCC. Texture, and visual impact, as much as anything. To give you an idea, I also use a variety of beans… in this batch, the traditional Kidney beans… as well as Great Northerns… the red and white play well together, both taste wise and visually. I try to add elements that give both the high and the low…. the Mushrooms, as you suggest are the low end of flavor intensity… (though by using the Baby Bellas, I’m not so subtle as to reach into BLAND, really. ) The visual impact, though is quite a bit more than NOT putting them in. Perhaps you don’t understand; I’m not using them sliced… but whole… each ‘shroom is about the size of a quarter. Gives a really chunky look. Taste-wise, it adds a subtle earthy quality. it Cincinatti chili which was served over noodles. my chili, and find it interesting to see other like their’s. the venison, but he didn’t know. and not one of whom knew the recipe. Good chili, and it was good skiing. If we get snow, I’ll be back next year. Well, really, that’s the beauty of it. It never really comes out the same twice. I’ll be honest; I have not used a recipe… exactly… in years. A lot of times, I’ll tend to use whatever is left in the fridge. Tomatoes from last night’s salad, onions from the burgers the night before, sometimes left over pork chops. Whatever’s handy. the trick is being able to adapt these ingredients into something that works. Much the same as a musician would improvise, I’ve learned over the years to improvise with my cooking. Surprisingly enough it generally works. Generally works! Sounds like a warning. Oh well. I thought was ever was left in the frig was Mulligan Stew, but then what do I know? I like the approach.